For some children, reading and comprehending a written text full of notions, narrations and descriptions, can constitute an insurmountable obstacle, often caused by a deficient in the visuo-perceptual field. 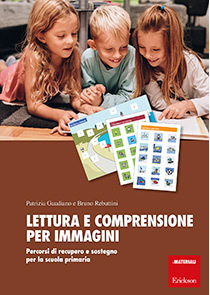 The goal of the program presented in the book is to favor the reading-writing learning processes through the decoding and interpretation of images, which facilitates the construction of coherent mental representations, supporting attention span and the working memory. • Section 3 – Integration of verbal and iconic codes: attributing meaning to characters and context. The volume is enriched with stickers and colourful chards that act as further motivational reinforcement.